Having just spent a few days in Wales my thoughts turned inevitably to the Welsh Rock scene.It took until the 90’s for Wales to really register on the rockometer and for a few years being welsh was really cool. Not so in the 70’s. I have already written about Budgie, a band so hard working they would come and play in Norwich. Apart from the avian influenced power trio there was only one other welsh band that registered much interest among the casual punters. And that band was Man. Believe it or not there is actually a book about welsh guitarists, I know because I have a copy. It’s written by Deke Leonard, a pretty good guitarist himself and an on/off member of the aforementioned Man. The king of the Swansea players was without doubt Mickey Jones who even Deke Leonard was in awe of. Jones was pretty much the main man of Man which managed to shift through over 20 players in its lifetime. With Jones at the helm the band had a reputation for being a sort of a Welsh Grateful Dead, whether any of us wanted a Welsh Grateful Dead in 1972 was debatable and perhaps because of this Man remained fairly firmly in the second league playing polytechnics, colleges, universities and clubs united in their dedication to stoned jamming. And as such they largely passed me by, I do have reason to be grateful to them though. About 10 years ago I decided that it was time to sell off my vinyl collection, I could see a time when ‘proper’ records would be worth nothing so I wanted to sell up while I could at least get rid of them for money. So I would list by records on ebay a few at a time then package them at a huge cost in time and money and send them off, usually to a collector, somewhere in the world. 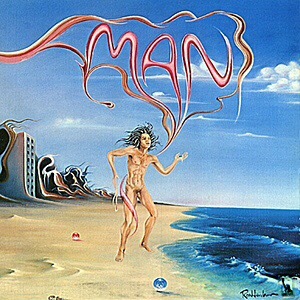 Most of my treasured records would sell for a couple of pounds, the only exception to this was ‘Man’ by Man, a record mainly notable for having a drawing of a naked man on the cover which went into double figures, my best selling record ever. Of course the glory times for Man were just a few years from the early 70’s to the time when everyone had to be ‘New Wave’. But like just about every band of any reputation Man just couldn’t let go, they ‘reformed’, Deke was in, he was out, he was in again, members were bringing in their sons to replace missing members. And that was another reason I’ve been thinking about Man. My friend John was a big Man fan. I say friend but really he was a friend of a friend really, I might see him 10 time a year or once in two years but it was always good to see him. He was about eight years older than me but had gone bald virtually from childhood and after that barely aged over decades. That age difference made him of another era hence his dedication to the sounds of The Dead and Man but he was a musician himself and we always had something to talk about whenever we met. And so when Man reformed John was waiting for them. For some inexplicable reason the band were big in Belgium as well as, inevitably, Germany. In the 90’s there weren’t many people in Britain who cared that much though and John reported seeing them in clubs where they outnumbered the audience, I really wondered why they bothered but I probably underestimated the addiction of music. John was happy though, his band even got to support Man and he got to play his bass through their bass rig which apparently was the peak of his musical career. John’s musical career petered out about the same time as Man and he went off to live in rural idyll in Norfolk… dunrockin. By the new century there was very little to keep the band going. Guitar Ace Micky Jones had been diagnosed with a recurring brain tumour which led to a physical decline and his demise in a Cardiff nursing home. A couple of the old guard, keyboard player Clive John and bassist Ken Whaley died from emphysema and lung cancer respectively, possibly as a result of too many carcinogenic spliffs. Keyboard player Phil Ryan who had kept the band going until the point of pointless was well passed was the next to go followed by Deke Leonard himself early this year. And as I awoke to the sound of seagulls I was informed that John had joined them having passed away on midsummer’s day. Just a few weeks ago he had got fed up with feeling crap from a suspected virus that wouldn’t go away and decided it was time to go and visit the Doctor. From then on it was rapidly downhill to a thankfully peaceful death at home it wasn’t a virus of course it was cancer. And so this is for you John, I suspect that like most of the world you never read the future is past but I’m sure you would have liked it at least a bit. This entry was posted in memories of 70s, prog rock, rock music and tagged 1970's, 70's biography, band reformations, East Anglia, guitars, Hippies, man, pop music, rock music, vinyl, welsh bands. Bookmark the permalink.